Grace Mary Whittaker, SCN, is being honored by Saint Joseph Montessori Childen’s Center where she is in ministry. 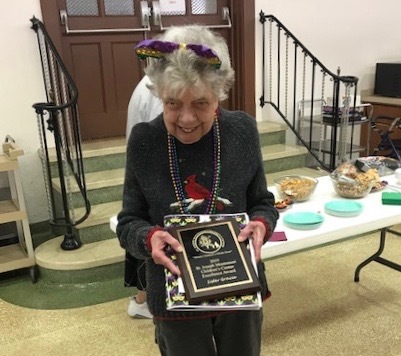 She recently received a plaque for being an outstanding volunteer. She can always be found smiling and laughing as she helps out in the classrooms. Sister Grace is a much loved presence on the Nazareth Motherhouse Campus, Nazareth, Kentucky. Step into the Visitors Center, she welcomes you to Nazareth. Walk into the dining room, she pops up from her seat to get you a cup of coffee. Stop by the Montessori school, you see kids clammer to hug her. Her recent ministries have involved offering hospitality and greeting visitors. Sister Grace has also been very active with SCN mission trips. Her trips have taken her to Appalachia and to New Orleans. In New Orleans, Sister Grace has attended Nun Build three times. A native of Bradford, Massachusetts, Sister Grace made vows in 1958. Early on she served at the Infants Home in Louisville, Kentucky and went on to teach primary grades in Calvert City, Kentucky. Sister Grace also spent nearly thirty years at the front desk of the Motherhouse greeting guests, answering questions, and running the switchboard. Grace, You are a wonderful person in every sense of the word. Thank you for being your own self. Gracie, what a great tribute to you. You are a wonderful presense to all on Naz campus. Hi Grace. I’m happy for you. Keep up the good work. Your “classmate from Entrance Day.” Love, Martha in Quincy. YOU RECEIVED AN AWARD AND YOU ARE AN AWARD……. IN SO MANY WAYS AND PLACES. WE ARE GRATEFUL. WE LOVE YOU! S. Gracie, you are one of the kindest, loving, sweetest women I have ever met. Your smile lights up a room so it’s easy to see why children and adults love you so much. God bless you! Grace, I happy to see you got that award . You well deserved that. You are Sister of Hospitality always a smile and most gracious. I am privileged to be call “friend” . Congratulations. God bless you! We are so very grateful to you and all you do for not only Montessori but for everyone on campus.